Afghan seeds are a great choice for growers looking for a pure, 100% Indica marijuana strain which is easy to grow.These Afghan seeds are becoming increasingly popular with medical marijuana growers looking for a strong medical strain with good pain relieving properties, as well as relief from nausea, stress and tension. Whichever growing method you prefer Indoor, outdoor, soil or hydroponics,these Afghan seeds are suited to all styles and techniques. Germination is 100% guaranteed, so no risks on buying low quality seeds, and once these seedlings become established, the plants grow quickly, producing a strong stem and branch structure. As an indoor cultivated Cannabis strain, Afghan seeds grow well, responding to both Sea and Screen-Of-Green techniques (SOG, SCROG) producing strong, close-knit branches, capable of supporting the heavy, dense buds. Flowering times can quite long for a pure Indica, with Afghan plants requiring approximately 76 days to achieve peak maturity and full production of both THC and CBD. Stable and uniform, these Afghan Medical Marijuana seeds are 100% feminized, guaranteeing you will receive and grow female only plants,displaying all the traits and characteristics you expect and with both delivery and germination guaranteed, you know your seeds are of the highest quality available. These fantastic Afghan seeds from I Love Growing Marijuana are available in packs of 5, 10 and 20 feminized seeds, all guaranteed by Robert Bergman himself. 100% pure Indica these feminized and stable seeds offer the very best in Marijuana genetics. 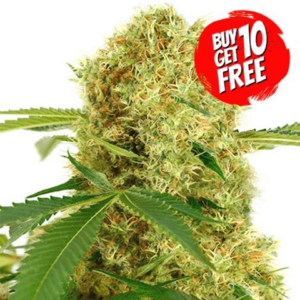 White Widow Seeds Special Offers! White Widow produces a sociable, talkative, relaxed feeling that makes it a great smoke to enjoy with friends. Perfect for day and night use with a strong, pain-relieving ‘body-buzz’ and happy, euphoric high. Too much, too fast, can produce ‘couch-lock’ in light smokers. A compact, dense plant with large, deep green leaves and close, strong branches, and a good harvest of dense, sticky buds, frosted and coated in resin. White Widow seeds produce the heaviest yields when grown using either Sea-of-Green (SOG), or Screen-of-Green (Scrog) techniques. A well-known and popular choice of medicinal Cannabis, favoured for it’s pain relieving properties and ability to reduce stress and anxiety, easing depression. Can have a positive effect on insomniac’s, assisting relaxation and sleep. NOTICE: You may be asked to return the ungerminated feminized seeds.